Posted in animals, photography and tagged animals, cat, cats, cute, shoe hug on September 21, 2015 by Fiona. This is a photo from late 2013. I didn’t take it. 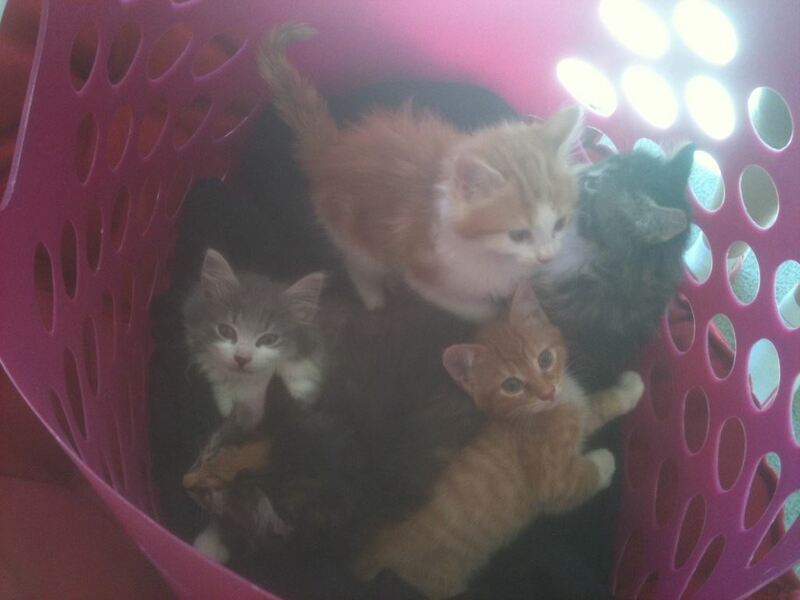 It was sent to us by a friend who had a friend who had a friend who had ended up with a litter of kittens needing homes. It’s a long story, but these little guys were very lucky to be taken in by a kind lady who intervened when she heard they were to be euthanised for the sole reason that they were born to a cat whose family couldn’t bother spaying her. I recently found this image while going through old photo files. The tabby at the top right is my baby Riker, who came home with us a few weeks after this image was taken. He had a rough start to life before being taken in by some people who got the litter much-needed vaccinations and flea treatment and baths. Our friends took in the ginger tabby at the bottom right who, amazingly enough, is a female cat. Ginger females are meant to be rare; though I personally know three people with ginger female cats, so maybe the notion that they’re an impossible colour and gender combination needs to be reassessed. I’ve heard that the long haired kittens in the litter ended up bigger-than-average, our Riker included. I am fairly certain that he has Siberian Cat heritage somewhere in his recent ancestry. The short haired kittens in the litter ended up average-sized. I am very grateful for now-not-so-little Riker coming into my life. I can’t imagine how I coped for so long without animal companions. Riker and our slightly younger cat Odin have been a ray of sunshine in our family’s life. Posted in animals and tagged animals, cat, cats, cute, flashback, kittens, memories, pets, rescue pets on September 18, 2015 by Fiona. Odin looking pretty happy. July 2015. Great is the joy of a cat who actually likes belly rubs. In this case, you can give Odin about 15 belly rubs before the claws come out. Our other cat Riker allows precisely 1/4 of a belly rub before he sinks his teeth into one’s hand. Posted in animals and tagged animals, cat, cute, happy, pets on August 8, 2015 by Fiona. 2015 – Riker the cat “helping” construct Ikea furniture. 2015 – Odin the cat hiding from the vet at his annual check-up. Posted in animals and tagged animals, cats, cute, funny, ikea, pets on August 5, 2015 by Fiona.